Trout School tells the story of how Mo Bradley was part of a small group of dedicated fly fishers who in the 1960s developed new tactics for taking Kamloops trout in the dry, central plateau region of British Columbia. One cold December night, Mo called me in Vancouver from his home in Kamloops. It was just after Christmas and he was checking in. He was his usual cheerful self, telling me about the 170 ice-fishing rigs he was making for an event the Kamloops and District Fish and Game Association holds annually to encourage families to go fishing. “To impress a kid, to get them fishing for life, just give them a little rod with a reel and let them catch a fish,” said Mo, who, unlike some fly fishers, is not an elitist. If you love to fish and respect the environment, you are good in his books. And he liked the ice-fishing event because it was so much fun to see the kids and new immigrants to Canada laughing as they caught their first trout. That winter, three hundred people attended, and Mo was busy all day, walking from hole to hole with a box of maggots in his pocket, which he used to bait the ice-fishing flies for people who had never fished before. We talked about some patterns he was experimenting with and he said they would be in the mail shortly for me to try. Then he told me he was going blind. They had gone to see his optometrist, who leaned in for a close look at his eyes, and then shook his head. His condition stabilized, but with only 40 percent of his vision remaining, he can’t drive and has to be careful walking because, as he puts it, “I can’t see my own feet.” Even so, he can still tie a fly in no time flat and has “a bushel of friends” who will drive him out to the lakes and launch a boat for him. Somehow he still knows where the fish are rising and can drop his fly near the spreading rings. When my daughter Claire and I visited to interview him for this book, Mo never complained about his eyesight, and soon had us in the big walk-in closet he’d turned into a fly-tying station. Each year he donates about three thousand hand-tied flies to conservation groups, which sell them to raise funds. Material was stacked everywhere. He pulled open drawers with bags of pheasant tails, deer hair, musk ox, and polar bear fur. While we talked, he placed a hook in the vice and . . .when he finished, he pulled out a small pattern with shiny eyes. “This is the new water boatman I’m tying now,” he said happily. “What are the eyes?” asked Claire, holding it up and turning it in the light. “You know when you go into the fishing store and there’s, not a string, but a knobby piece of plastic holding the price tag? Well, that’s what they are,” he said. For years Mo has worked a few days a week at Surplus Herby’s, a cluttered one-stop shop for all the camping and outdoor gear you could ever dream of, which bills itself as “The craziest store in town!” He can be found in the fishing department, where a poster announces: “Master Fly Fisherman Mo Bradley will give you a 1 hr casting lesson for only $25.” The department is remarkably well stocked, with everything from starter fly-fishing kits to expensive graphite rods. Fly fishers from all over British Columbia stop at Surplus Herby’s to buy tackle, but also to seek out Mo and get his advice. Many tell him they were drawn to fly fishing by his television and radio shows which ran on local programs in Kamloops for decades. Sometimes he’ll shake the hand of some tall stranger, usually a man but often a woman, who will look down at him and say: “You taught me to tie flies when I was a little kid.” Often they will share their secret fishing spots with him, telling him about lakes producing six-pound trout. Ranchers give him the keys to their gates and invite him to fish their private waters. They feel blessed to be fly fishers, and they are looking for a way to pay back the man who put them on the right path. Between customers he will sit at the counter and tie flies. One day he was working on a water boatmen pattern and wondering how to make it more realistic. He thought about adding eyes, but needed something tiny—a white plastic orb. “I was walking around the store and they were laying on the floor,” he said of the plastic chains. “I thought, ‘Those are like the eyes I’m looking for.’ And they were them bloody price tag things. The staff here save them for me now, and it’s not long before I’ve got a bag full for eyes.” Mo couldn’t have been happier with his discovery. Found items picked up off the floor at Surplus Herby’s by the salespeople and cashiers had been incorporated into his latest pattern. Soon the eyes tied on by a nearly blind old fly fisher would be swimming through the lakes around Kamloops and undoubtedly fooling lots of trout. Mo continues to experiment and push the boundaries of fly fishing. Every so often a little parcel arrives in the mail, and inside I’ll find a new pattern he’s working on. The latest batch included some caddis pupae with cases made of stick or stone. My journey with Mo began shortly after I came across his little pamphlet, From Ice Off… To Ice On, which he gave to anyone taking the fly tying courses he used to teach. The text was modest, but filled with simple truths. Mo ended his booklet with a few comments worth copying here because they hold a good message and give insight into what kind of angler he is: contemplative, observant, patient, and dedicated to protecting the environment he loves. “Fly tying and fly fishing should be a relaxing and therapeutic sport in this age of hurry and bustle. After a day of endless phone calls and paper shuffling, one needs to get away and relax. What I do after such a day is depart to one of my favorite lakes, sit in my Rebel one man boat and let Mother Nature unwind all my woes. A brew sometimes helps. In fact, be quiet, observant and usually you will find fish in what is one of the world’s last places of total freedom and tranquility. It is revealing of his character that, after sharing the secrets he’d learned over a lifetime, he thanked readers for taking the time to hear him out. Mo escaped a dark life in the mines of the East Midlands of England and, drawn by rainbow trout, immigrated to Canada with his wife, Evelyn, where he found paradise in the lake country around Kamloops. He was forever grateful for that. He was welcomed into the fly-fishing fraternity and throughout his life has done his best to thank those whose kindness helped him along the way, and to show his love for the trout that brought him such peace. I’ve learned from him, not just about fly patterns and the importance of observing while nature unfolds, but also about the obligations we have to one another as fly fishers. Although I like to fish in solitude and always want to have a lake to myself, I understand now that there’s real joy in sharing, not just the water, but fly-fishing knowledge too. 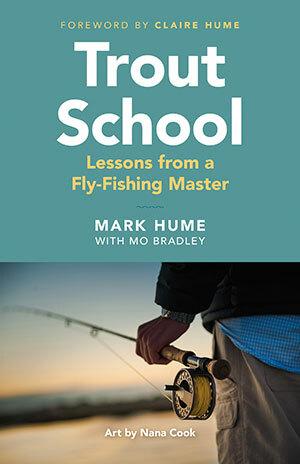 Excerpted with permission from Trout School: Lessons from a Fly-Fishing Master, by Mark Hume with Mo Bradley, now available from Greystone Books.